Crabs with clipboards and bears who build are some of the animals who come together in One House to DIY a new home from start to finish for their friend. Plans are drafted, holes are dug, and construction begins! This board book will delight little ones with its quirky illustrations and rhyming countdown. With teamwork, generosity and some special skills, it's amazing what these critters can accomplish! "The charming mixed-media illustrations provide so much visual interest…and the age-appropriate rhyming text is a sweet accompaniment. The beautiful, inviting illustrations ensure readers will keep coming back, finding new details to delight in upon each revisit." "A board book that parents and toddlers will want to come back to time and time again!" 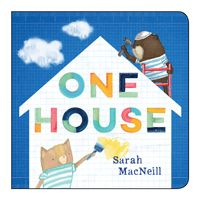 "An excellent home purchase and a welcome addition to the counting book collections of libraries serving preschoolers. Recommended."